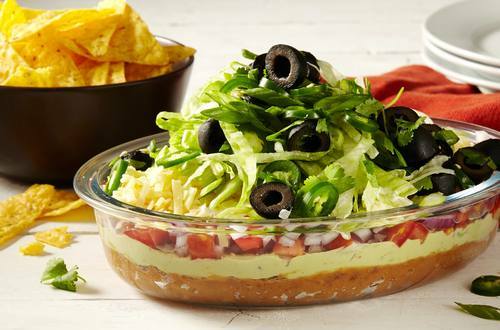 This seven layer dip recipe with smooth, creamy Hellmann's® or Best Foods® Real Mayonnaise is big on classic flavors. A vibrant dish that's perfect for entertaining. 1 Combine refried beans with taco seasoning mix in small bowl. Spread onto bottom of 2-qt. glass baking dish; set aside. 2 Process avocados, 2 Tbsp. Hellmann's® or Best Foods® Real Mayonnaise, red chile pepper and lemon juice in blender or food processor until smooth. Spread over bean layer. Sprinkle with red onion, then add tomatoes; set aside. 3 Combine sour cream with remaining 2 Tbsp. Hellmann's® or Best Foods® Real Mayonnaise, then spread over tomatoes. Top with cheese, then olives, then lettuce and green onions. Garnish, if desired, with sliced jalapeño pepper and/or sliced green bell pepper. Serve, if desired, with tortilla chips or your favorite dippers.